Resilient organizations must focus on three main areas when it comes to cyber resilience—being hard to hit, being ready for the attack when it comes, and being able to recover quickly. RedSeal identifies cyber defensive gaps, runs continuous penetration tests to measure readiness, and helps an organization capture a map of their entire network infrastructure. The RedSeal Platform delivers continuous monitoring through the collection and correlation of change management, configuration assessment and vulnerability exposure information. Turning these capabilities into cyber resilience measurements gives managers, boards of directors and executive management the understandable and actionable security metrics they need to drive towards digital resilience. Do you have defects that are easy to hit? RedSeal evaluates how weaknesses from incorrectly configured devices and third-party software could impact your digital resilience and help organizations to embed best practices in network security. Can an attacker reach your valuable assets? RedSeal evaluates cyber resilience by measuring how well your network is structured, identifying attack pathways and chains of vulnerability that reduce your ability to withstand and recover from network vulnerabilities and threats. Is your network understanding complete? By identifying previously unknown parts of your network, RedSeal evaluates how well you know what your digital infrastructure looks like. With a complete picture, you can be sure you’re managing all assets on your network. During an attack, you’ll be able to understand where an attacker can reach. And, you’ll be able to recover much more quickly. A higher score means you’re becoming more resilient. 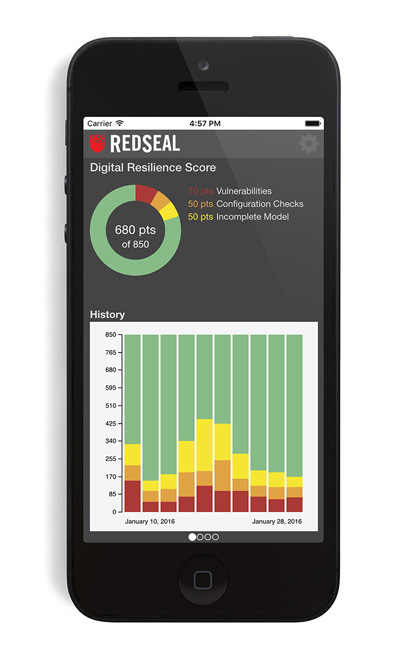 Whether you view it from our smartphone app or our dashboard, RedSeal’s Digital Resilience Score tops out at 850, like a creditworthiness score. The Digital Resilience Score deducts points for defensive gaps, weaknesses revealed by attack simulations, and blind spots in your network awareness. A higher Digital Resilience Score means there is a higher likelihood that your business can withstand an incident and keep running. Raising your score means you are heading in a more resilient direction. These security metrics are normalized so that the score doesn’t get distorted as your organization grows, and, it provides valuable information when you’re evaluating potential mergers or acquisitions. RedSeal’s smartphone app for Android or iPhone gives you a real-time, at-a-glance view of your network’s cyber resilience. The smartphone-based security app lets you see your security status and progress, and lets you share your latest security metrics with your security team, management and board members. You can download the smartphone security app at no charge from the iOS App Store or Google Play.